If you’ve followed Allergy Amulet lately, you know we LOVE to talk about food allergies. Recently, we discussed the phenomenon of Oral Allergy Syndrome: a typically mild allergic reaction that can occur after eating a raw fruit or vegetable. This got us thinking: What other unusual allergy phenomena are out there? We attempt to answer just that question in this post, because allergies aren’t always as common as peanut, pollen, and pet dander. They can also include red meat, metal, and even WATER! While rare, these allergies are just as real. Here, we break them down for you. If you’re a Radiolab fan like we are, you are definitely going to want to tune in to this podcast. The podcast follows the story of a woman who developed a meat allergy from a tick bite! One bite from a Lone Star tick can cause people to develop an allergy to red meat, including beef and pork. This type of allergy has been attributed to a sugar in meat called “alpha-gal.” Individuals bitten by the tick develop antibodies against this sugar. Symptoms include congestion, rash, nausea, swelling, and even anaphylaxis. Symptoms usually manifest within 4 to 6 hours after eating red meat. 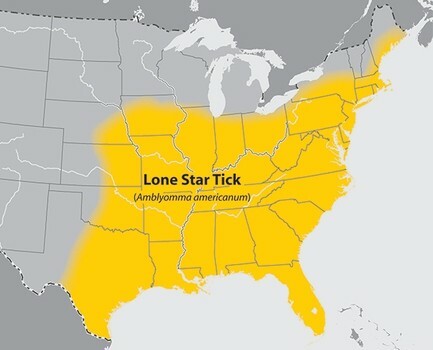 That said, be sure to check for ticks if you’re hiking in THIS region of the US! Additionally, a letter recently published by researchers in the Journal of Allergy and Clinical Immunology warns that the Zoster (shingles) and MMR (measles, mumps, and rubella) vaccines have been linked to anaphylactic reactions to meat. This type of allergy has been reported only about 1,000 times since the 1970s. Exercise-induced allergic reactions typically occur during or after exercise, and generally follow from eating certain foods beforehand. Symptoms range from a mild rash and hives to anaphylaxis. The most commonly-reported incidents of exercise-induced anaphylaxis involve wheat, shellfish, tomatoes, peanuts, and corn. Gelatin—a protein derived from collagen—forms when connective animal tissue or skin is boiled. Allergic reactions to gelatin are often linked to vaccines, as many contain porcine gelatin as a stabilizer. Gelatin is also found in most gummy candies, as well as in products like marshmallows and some ice creams, dips, and yogurts. If you thought you were allergic to gummy bears, it may actually be gelatin! Have you ever experienced a foot rash after wearing leather shoes? Leather probably isn’t the culprit—you’re more likely allergic to the chrome used in the tanning process. Leather allergies are generally restricted to skin rashes. Several well-known car companies actually avoid using chromium on their leather seats because of this known allergy. So if the anti-fungal powders aren’t working, and you wear leather shoes, it may be because you have a chrome allergy! Water-you talking about?! Yes, there is such a thing as a water allergy. An allergy to water, or aquagenic urticaria, is very rare. There are less than 100 cases reported in medical literature. Affected individuals typically develop hives when their skin comes in contact with water, regardless of the temperature. This condition appears more commonly in women, and most often during puberty. The hives and itchiness most often appear on the neck, upper trunk, and arms, and usually go away in 15-30 minutes. Antihistamines generally help relieve symptoms. Latex allergy is most commonly diagnosed in individuals frequently exposed to latex, such as healthcare professionals. It’s estimated that less than 1% of the US population has an allergy to latex, but for those in the healthcare sector, it’s closer to 8-17%! Interestingly, a latex allergy can also produce an allergic reaction to certain foods because of cross-reactivity (check out our blog post on Oral Allergy Syndrome to learn more about this phenomenon)! Individuals with a latex allergy need to stay alert, as latex can hide in unexpected places like mattresses, root canal sealant, utensils, and spandex. It is estimated that 2-3% of individuals live with a spice allergy. Allergies to spices such as garlic or coriander are rare and usually mild, although severe reactions have been reported. Reactions can occur from inhalation, ingestion, or touch. A spice allergy can be difficult to manage as spices are commonly used in foods, cosmetics, and dental products. For example, dentists often apply cloves to extracted wisdom teeth cavities after the operation. A good reminder to alert your dentist of all of your allergies—especially rare ones! Nickel allergy is a common cause of contact dermatitis—an itchy rash that pops up when your skin touches a normally harmless substance. Nickel is a silvery metal that is regularly mixed with other metals to form alloys. It is most often associated with earrings and other jewelry, but can also be found in many everyday items like cell phones, chairs, zippers, coins, and eyeglass frames. It may take repeat or prolonged exposure to items containing nickel to develop an allergy. Treatment may reduce the symptoms, but once you develop a nickel allergy, you’ll always be sensitive and will need to avoid exposure. Dermographism urticaria, or “skin writing,” is a type of allergy where you can write on your skin with the pressure from your fingernail. Firm pressure on the skin creates red wheals, which may accompany itching. Dermographism affects approximately 4% of the population. It can manifest at any age, but is most common in young adults. Symptomatic dermographism is usually idiopathic (of an unknown cause), though it may have an immunologic basis in some patients. Trauma to the body may play a role as well. This type of rash typically goes away after about 15-30 minutes, and can be controlled with antihistamines. Last but not least is an allergy to cold temperatures. Yes, you read that correctly. Cold urticaria is a skin condition that manifests when the skin is exposed to low temperatures. It is most common in young adults. Symptoms are generally limited to hives; however, the severity of cold urticaria varies widely. A whole body (systemic) reaction—the more severe form—typically occurs after swimming in cold water. This can lead to low blood pressure, shock, and even death. The cause for this allergy is poorly understood. The good news is that this type of allergy generally only lasts a few years. So, have we sufficiently scared you? Or are you now more fascinated by the human immune system than ever before? We hope it’s the latter! Allergy Amulet advisors Dr. Jordan Scott and Dr. John Lee have reviewed this piece for accuracy. Dr. Scott is an allergist/immunologist and operates several private allergy clinics throughout the Boston area. He is on the board of overseers at Boston Children’s Hospital, and the past president of the Massachusetts Allergy and Asthma Society. Dr. Scott is an allergy/immunology instructor at the University of Massachusetts. Dr. Lee is the clinical director of the food allergy program at Boston Children’s Hospital and an Instructor in Medicine at Harvard Medical School. He is also the co-creator of AllergyHome.org, a website that offers online resources to help educate and promote awareness about food allergies in schools, camps, and other settings. Dr. Lee is widely recognized for his work in the food allergy space, and his commitment to patient health.